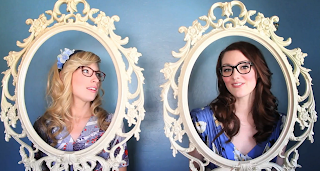 This is our last video for The Girls With Glasses Gift Guide Series. And our gift guide would not be complete with out giving our sisters some gift giving love. Watch the youtube video from your phone here. You can watch the youtube video from your phone here. Brooke and Summer reveal what they are getting their moms for Christmas. 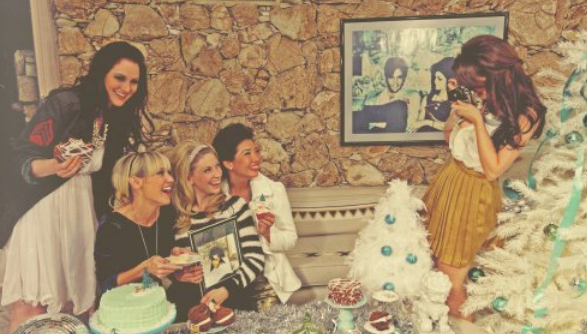 Brooke and Summer share gift ideas for the men in your life. Watch the youtube video from your phone here. Kate Spade loves the Girls with Glasses and we love them right back! Check our feature on the Kate Spade website and watch our gift guide below. can't be recalled within your head. don't let the bustle pull you apart. with angels out of view. the season to remember, remember you are loved. remember you are loved. love love love loved. put the jingle back in your rock'n'roll. lift the hearts of others who mope. 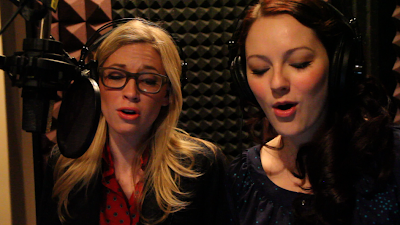 Brooke White and Summer Bellessa's holiday song is called "You Are Loved." It is dedicated to anyone who has the holiday blues or for those times when you just don't feel the holiday cheer. Sometimes we forgot the words...but we did have fun making it. Happy Holidays! *for your phone watch it here. Here's a new video with Brooke and Summer trying to get The Girls With Glasses Show on television. This one is a short film comedy. Thank you to everyone who helped make it happen. special thanks to Mallory Jarvis, The Bells Family, Fashion by Robert Black. Carbondale Chasmite! What a name! Brooke and Summer picked their 10 favorite commenters (based on their answers and the number of outlets that they shared the Warby Parker message). We put those 10 on sheets of paper and randomly picked. Carbondale Chasmite, who made his comment to give his wife another chance at winning, was the lucky duck. 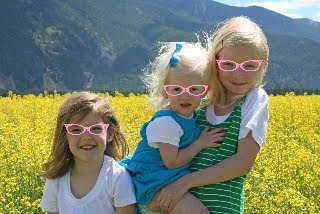 "My wife reads this blog... and loves those glasses. Gotta be a good man and get her another shot... though I wouldn't mind a pair myself. :)"
Great job, your comment paid off! Email us at thegwgshow (at) gmail (dot) com, with your wife's prescription and address!!! We look forward to hearing how she likes them. Win A Pair of Glasses! Whether you need glasses or not (we know some of you are fakers), you can win a divine pair of Warby Parker specs, complete with your prescription (or lack there of). Watch Brooke and Summer interview two of the founders of the charitable eye glasses company Warby Parker. Then make a comment; tell us your favorite thing about them. Is it the style? Is it the heart? What do you think? To get extra chances to win tweet this post, facebook share, write your own blog and then comment to let us know what you did. 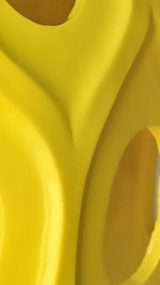 On Friday, we will announce the winner of these fabulous glasses. This is one of the most fun videos we have gotten to do. Even though the week we were there NYC had a record breaking heat wave, the energy of New York kept us going and feeling energized. We had a great time enjoying all of our favorite places including: Central Park, Strawberry Fields, Ice Cream at the Odeon, Statue of Liberty, Soho, The Village, Time Square, etc. What are your favorite places in New York City? We had been fans of Dallas Shaw's work for years. Summer even featured her in one of the first ELIZA Magazines. It was exciting to get to meet her in person and chat about her new project with DKNY on twitter. The DKNY store was so big and bright--had a great vibe to it. 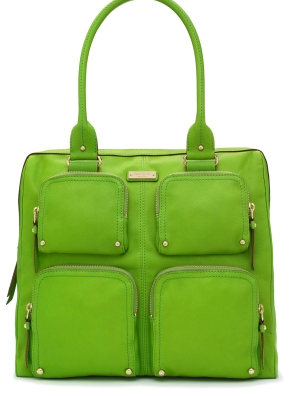 This beautiful Kate Spade bag has a name of it's own... "La Casita Josephine" AKA Summer's dream bag. This isn't technically a "carry on" but it is a perfect bag with loads of mini compartments to store all your little travel odds and ends. PS... it's on sale!! If you are the kind of gal that is always losing your writing utensil then we have found a solution for you, a completely adorable solution we might add! 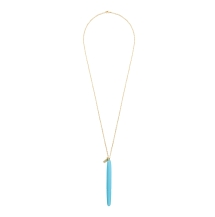 This cheery blue pen attached to a dainty gold chain can be found in a Kate Spade store near you! 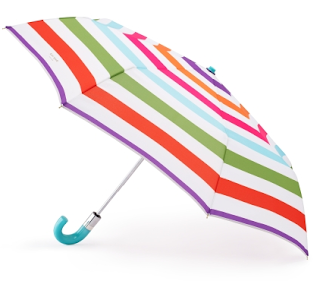 In addition to the fabulous items above, you can also find this striped umbrella that is ideal for keeping your lovely locks dry at a Kate Spade store on online... By the way, we love stripes. Summer swears by the Clarisonic, just take one look at her face and you'll be a believer. 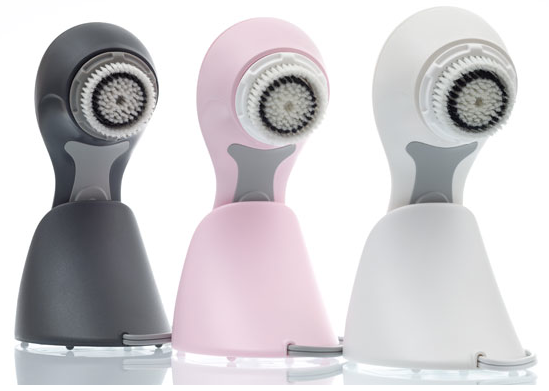 It is a little electronic contraption with swirling bristles that scrub all your make-up and grime away leaving your face ultra clean. It is a bit pricey, but you would consider it an investment in your skin. 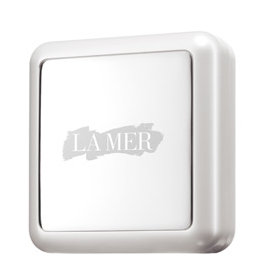 Constant travel will take it's toll on the appearance of skin, so proper care is necessary! 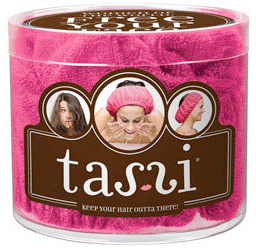 Flat hair, Oily roots, no access to a shower? 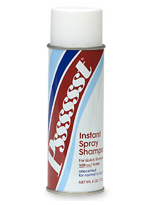 Try Dry shampoo... works wonders on a second, third... dare we say fourth day hair do's. There are several brands making dry shampoo, Brooke's personal favorite is Pssss which is super cheap and can be found at your local drugstore. This is another splurge... it's pretty fancy stuff, but if you are looking for a powder to wipe away signs of facial fatigue induced by a sleepless red eye flight, this is the one. It is soft as velvet and the color never looks fake or too pinky. As well it has a built in SPF 15. 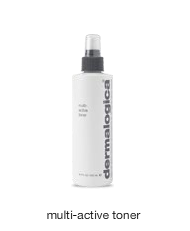 That not so fresh airplane cabin air doesn't do your skin any favors, you might notice that it begins to feel dry and tight after a long flight... Dermalogica makes some fantastic toners that will help to re-hydrate, refresh and calm your skin. Wouldn't it be wonderful to live in a world where everything was travel-sized... what an adorable world it would be. 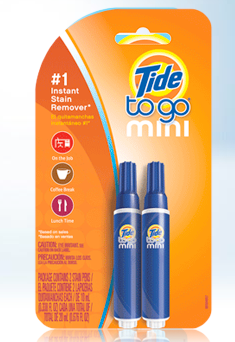 The tide to go mini pen is travel size and fits perfectly in your purse, so you'll be ready for those moments when perhaps you've hit some frightening turbulence and your tomato juice spills on to your fancy sweatpants. 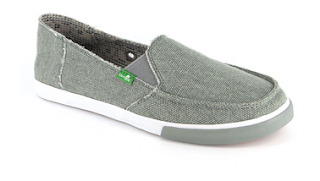 Whether you are running through the airport or walking down the boardwalk, a pair of "june bug" Sanuks are both ultra comfy and stylish, as well they don't take up much space in your suitcase. Oh and one other tip, don't forget a pair of warm socks for the airplane, the toes get chilly! The Girls With Glasses interview Corbin Bleu of High School Musical and broadway hit In The Heights. If you haven't seen Corbin as Usnavi, you better hurry, this is his last week in the role! Corbin Bleu captured our hearts in the worldwide sensation High School Musical. Until August 17th you can see Corbin perform In The Heights on Broadway. Brooke and I were able to see the show live and it's worth it. Corbin is such a big talent, it would be sad to miss his version of Usnavi, the Washington Heights bodega owner! Below is a sample of the show. 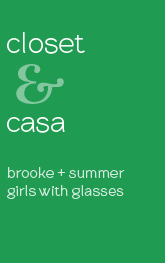 Brooke and Summer share their favorite products to take in their carry ons. 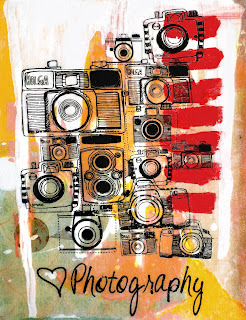 We are thrilled to get positive emails and even more excited by the cute things people make and share with us. 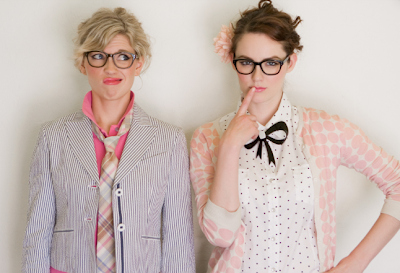 We want to feature two Girls With Glasses Show viewers today on the blog. The first is from Emilee Sutherland, the owner of Esty shop Tastful Tatters. 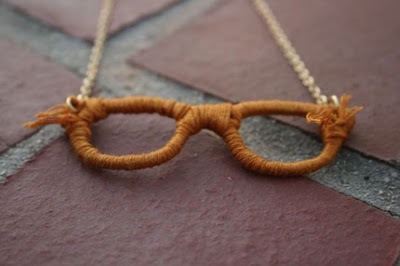 She made these charming little glasses necklaces "inspired by the infamous idol star Brooke White and her new show, The Girls With Glasses Show." 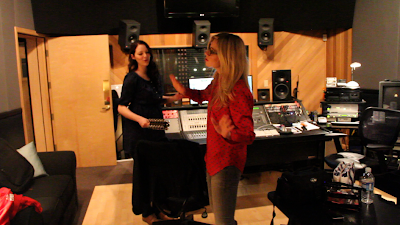 Second is Antonia Ormston who wrote to us saying " I love your theme song 'I am a Girl.' My three little girls love to watch your video. My eldest who just got glasses feels very cool now." And she included this heartwarming picture of her three girls. Thanks to everyone for your support and well wishes. We hope to continue to bring you inspiring content. 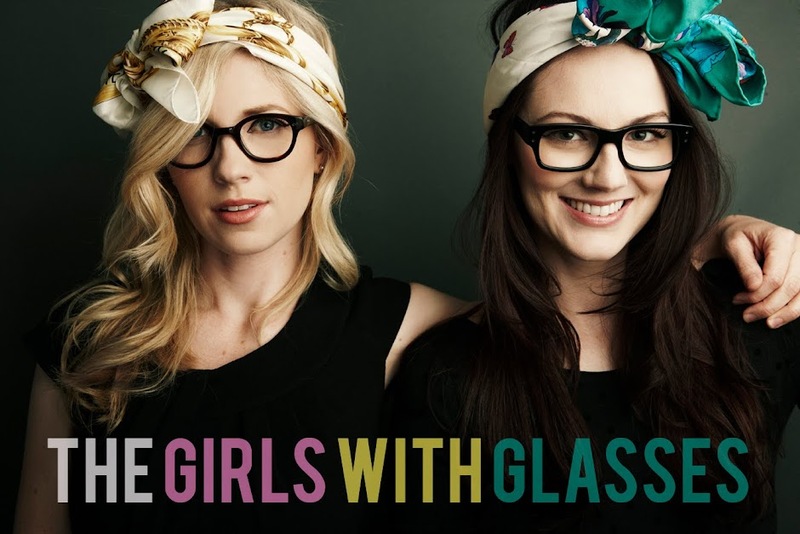 Send us an email (the GWG show (at) gmail (dot) com) if we can share how you are inspired by The Girls With Glasses Show. Although "being a trainwreck" is not what we are known for, in these shots we are looking like we are about to cause one. Going on a trip? Brooke and Summer, of The Girls With Glasses, show you just what to include in your suitcase and tips to making the most out of that little space. What People Are Saying from The Girls With Glasses on Vimeo. The “California Song” music video is available to view here and on thegirlswithglasses.com. 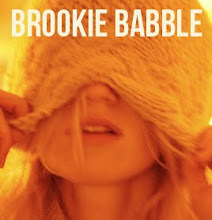 And since today is Brooke's birthday ... show some love by leaving a comment, sharing the video with your friends or purchasing the song on iTunes itunes.apple.com/us/album/california-song/id322319551?i=322319572. Making of the Girls With Glasses Theme Song from The Girls With Glasses on Vimeo. If you want to stay updated on everything GWG follow the twitter link. Their twitter will announce The Girls With Glasses Show news, videos, cool links and interesting things. 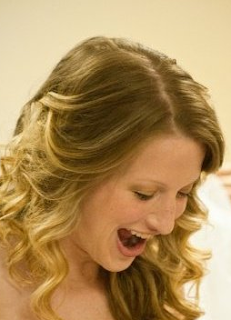 You can also follow Brooke White on twitter. Brooke keeps you updated on everything Brooke. See things through the eyes of one of the most genuine and talented people in the music industry. 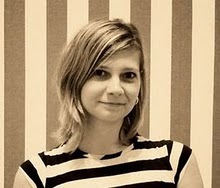 Last but not least, follow Summer Bellessa, ELIZA Magazine's editor-in-chief, on twitter. She takes you behind the scenes of running a fashion magazine and shares valuable tips on how to be fabulous. Glasses bring the world around you into clearer view: the vibrant details, the color, the fine print, all coming into focus. Not only are glasses practical, glasses are a defining and powerful accessory that can bring out the smart and savvy self that is inside all of us. The Girls With Glasses Show was founded for every woman who wants to be entertained while also being informed and enlightened—it’s the smart girl talk show. 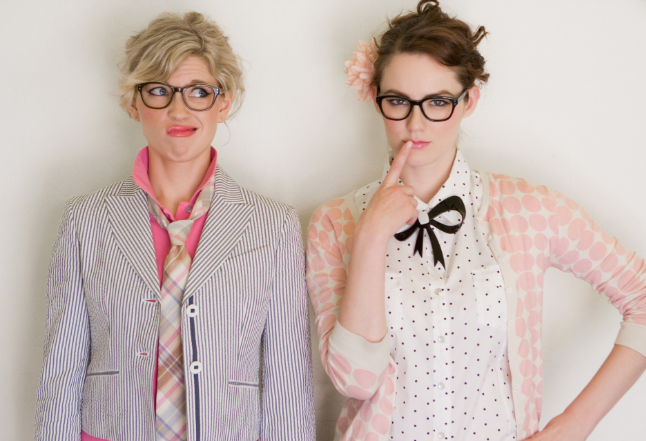 Brooke White and Summer Bellessa bring together humor, intelligent insight and heart to fashion, entertainment, art and music to this part-hipster and part-variety talk show—and yes, they both do wear glasses in real life. Each weekday, The Girls With Glasses Show will open with Brooke and Summer playing the theme song live. Think quirky like Wayne’s World, but re-touched with utterly hip, feminine and modern flair. 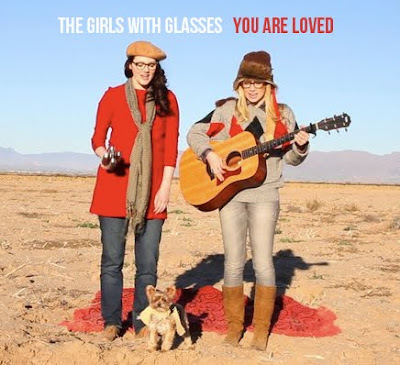 Music and lyrics to The Girls With Glasses Show theme song, “I’m a Girl,” is an original piece co-written by the hosts, with Brooke on vocals and piano and Summer on drums and back-up. 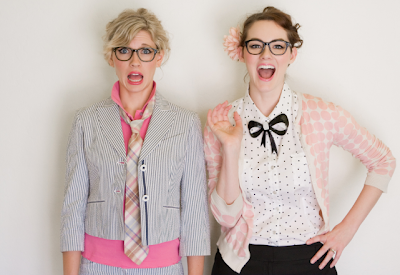 The Girls With Glasses Show will then showcase a relevant “Topic of the Day” such as: Best Friends, Fashion Icons, Business, Hand-Made, Good Role Models, The Cinema, etc. Following the “Topic of the Day” is “Taste Maker Moments” that coincide with a particular weekday, such as: Book Worm Monday, New Music Tuesday, Bloggy Wednesday, Gotta Have It Thursday and Date Night Friday. But the good stuff doesn’t stop there. The Girls With Glasses Show also includes a include a digital short, a special “on the street” segment with members from our Girls With Glasses team, a highlight of a lesser known musician, blogger, fashion designer, non-profit organizer, entrepreneur, author or artist, and finally, The Girls With Glasses Show will end with its main attraction, the celebrity interview. 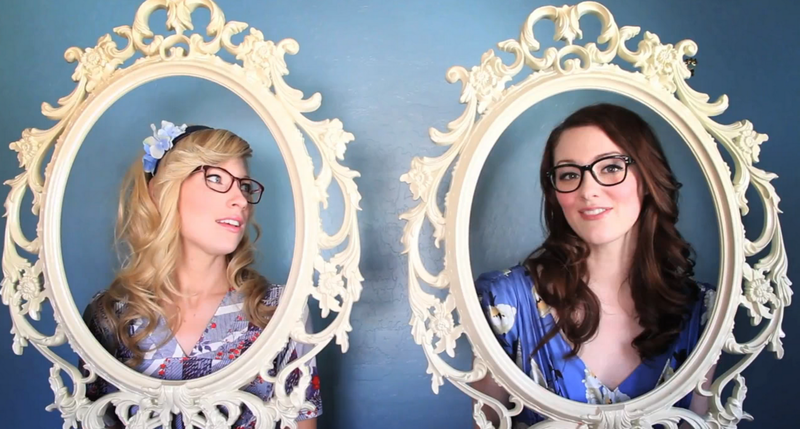 Check out Brooke and Summer in the Girls With Glasses Theme Song Video. 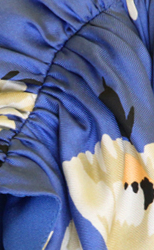 Special Thanks to: Fashion by Robert Black, Kerry Bellessa, Devin Colvin and Famous the dog. You were a trooper little guy.